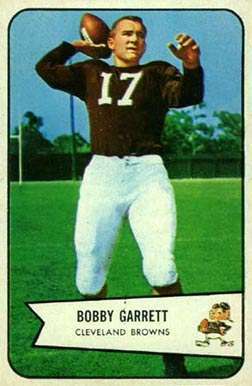 Robert Driscoll "Bobby" Garrett (August 16, 1932 – 5 December 1987) was an American football quarterback who played one season in the National Football League. Born in Los Angeles, California, Garrett was an All-American quarterback at Stanford University, where he also starred as a defensive back. In 1953, he became the third person to receive the W.J. Voit Memorial Trophy as the outstanding football player on the Pacific Coast. After he was named most valuable player of the Hula Bowl, he was drafted by the Cleveland Browns as the first overall selection in the 1954 NFL Draft. The Browns had needed someone to take over for the veteran Otto Graham, but they soon discovered that Garrett had a liability as a quarterback: he stuttered, which made calling plays difficult. Garrett never played a game for the Browns, who traded him along with halfback Don Miller and linemen Johnny Bauer and Chet Gierula to the Green Bay Packers for quarterback Babe Parilli and offensive tackle Bob Fleck. The Packers wanted a backup for veteran Tobin Rote, but did not learn of Garrett's stuttering problem before making the trade. Garrett played just nine games in the NFL. ↑ Merron, Jeff (2005-04-15). "The List: Weird NFL draft moments". ESPN.com (subscription required). Retrieved 2007-01-26. ↑ Cunningham, Michael (2001-08-06). "Camp Report". Milwaukee Journal Sentinel. Retrieved 2007-01-26.